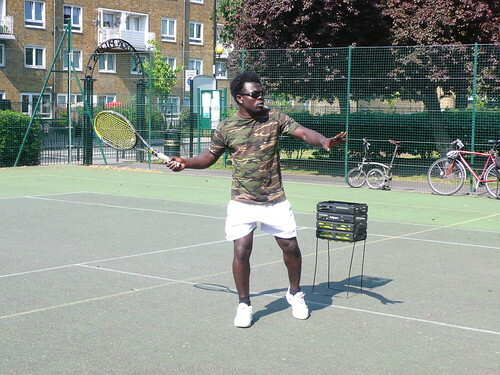 Fabian Awah Kum is a Lawn Tennis Association-qualified tennis coach based in Hackney, East London. Fabian’s sporting experience stretches back over two decades beginning when he enrolled at the Kadji Sports Academy in Cameroon at the age of 11. After spending 7 years at this prestigious institution, Fabian’s pursuit of a professional goalkeeping career brought him to London in 2002. During 2002 Fabian was invited to trials at Watford FC, Barnet and Luton Town. An injury that Fabian suffered during the trial period at Luton Town ultimately ended his persuit of a footballing career. Fabian began returning to fitness in 2003 and in doing so regained his love of tennis, a game which he had enjoyed playing at the Kadji academy. After contemplating a tennis career Fabian decided becoming a coach was the best way for him to give something back to the game. Now Fabian’s focus is to provide people of all ages with the skills, mentality and most importantly enthusiasm for the game of tennis.